If Slither.io represents the natural evolution of Snake, then Limax.io is the future. Still in a very playable alpha development stage, Limax.io is a new eat-or-be-eaten multiplayer game. It dutifully feels like many other .io games, requiring minimal effort or delay before playing. Let’s enter a nickname, choose a server, and start competing against slugs across the globe. 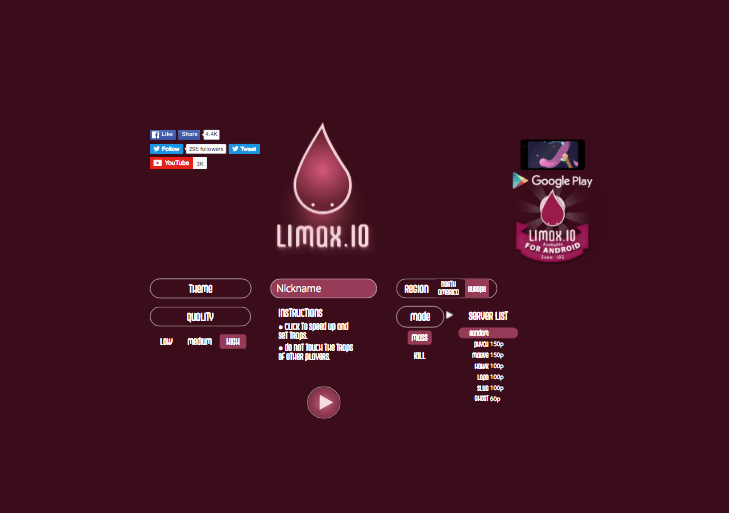 Limax.io features two main modes: Mass and Kill. Mass mode is nearly a clone of Slither.io, in which players compete to grow and dominate the arena. The bigger you are, the more points you earn. In order to achieve a spot on the leaderboard, you must eat safe orbs and dodge traps. Aggressive players can quickly rise through the ranks by speeding in front of other slugs and trapping them. Such a move both eliminates one foe and provides a healthy point boost. But, any time spent near other slugs increases the chance of being trapped. In Kill mode, each player’s score is solely based upon how many others they’ve defeated. Just like Slither.io, this awesome game Limax.io challenges players to move directly in front of one another. If someone crashes into your tail, they will die. Then, you can slither over their leftover orbs to grow and gain power. However, Limax.io’s Kill mode doesn’t directly reward larger creatures. Instead, you actually become a bigger target for others to trap. The main advantage of being large is that your slug can shed some weight for a quick speed boost. However, each speed boost may backfire, sending you directly into another’s tail and causing a game-ending death. Limax.io takes a barebones approach regarding options. There are no alternate control schemes or sound adjustments available. Graphically, players can set the quality (low, medium, or high) and choose a color scheme. Known as “themes,” each of the four color schemes are vastly different from one another. The default theme is filled with deep, red hues and soft pinks. For a wider color palette, either of the middle themes are appealing. The final theme consists of a black background and brightly colored slugs. I found the high-contrast color scheme to be easy on my eyes and friendlier to my tablet’s battery. Limax.io may not be in the final development stage, but it is perfectly functional and worth playing. In an hour of testing, I did not encounter any bugs or issues with servers. The minimal graphical interface doesn’t impose while playing. In the top-right corner, a leaderboard displays the top 10 scorers. The opposite corner displays your current stats, including kills, mass/score, and rank. The top-left portion of the screen pays tribute to the top score of the day. It shows the daily leader’s score (either mass or kill count) and how long they remained in first place. The graphics in Limax.io may not be as polished as Slither.io’s glowing visuals. But, the additional color schemes and gameplay mode in Limax.io provide a deeper experience. Get in on the latest .io game, and slug your way to the top.